Husband-and-wife team Kris Fade and Steven Thompson produce a delicate rose of pinot noir with grapes grown in the Columbia River Gorge AVA at Analemma Wines. We sip espresso from our window-front perch at Stoked Coffee Roasters while watching Frisbee-catching dogs and picnic goers at the waterfront park. 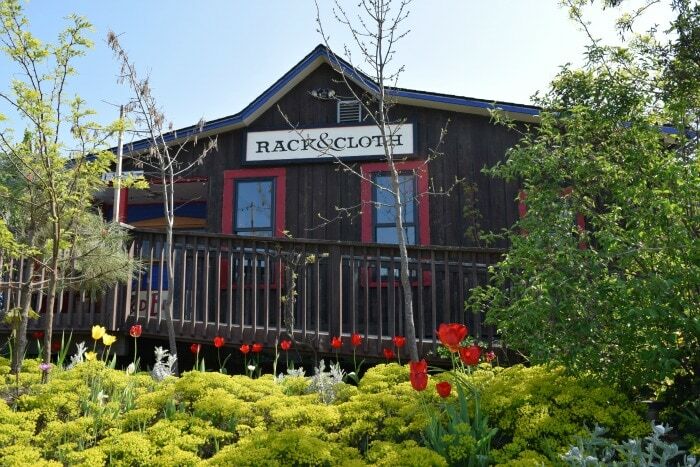 Rack & Cloth is a nano-cidery and café run by Kristina Nance and Silas Beakley. Editor’s note: This is part two of a wine country itinerary that stretches from the Willamette Valley to Walla Walla. See part one here. As we glide into downward facing dog, mountain peaks and wild flowers pop into view. It’s the third time we’ve arched into the yoga pose that resembles an upside down letter V, and each time I’m surprised (and in awe) of the striking landscape that appears on the flipside. Think forests and river, a sea of white clouds and sapphire sky. More surprising though is that I’m still dry and firmly planted on a lemon yellow, stand-up-paddle-board. It’s a late summer morning, and I’m checking items off my “things I’ve always wanted to do but never have because life is too busy” list. Item no. 1: SUP (stand-up-paddleboard) somewhere beautiful. With its wildflowers and waterfalls, soaring mountain summits and mossy creeks, the Columbia River Gorge is the first place that came to mind. It just so happens that Big Winds not only rents boards, but hosts seasonal SUP yoga classes for the daring and well-balanced. Our instructor, Rayna Morton, calls across the water for us to transition into Tree Pose. We all move slowly, feeling the river current swirl beneath our boards. My board drifts with the next gust and turns so I’m directly facing the snowcapped peak of Mt. Hood, the mountain and I saluting each other from a distance. The shades of green seen in one sweep — too many to count. With the serene waterscape, I’m finding yoga on the river much easier than anticipated. City life, chores and work stress seem so far away. Water enthusiasts also venture to the Gorge for sailing, whitewater rafting and kayaking. 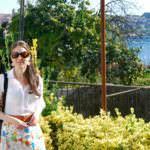 Of course, there’s hiking, biking, horseback riding and parasailing too. The designated National Scenic Area (the country’s first) stretches for more than 80 miles, dotted with lush waterfalls, ancient petroglyphs, and mountainous terrain. It always astounds me that this wild oasis is only an hour from Portland. Our SUP-yoga class is on the stretch of water just outside of the sporty town of Hood River. And after an hour-long workout, the first stop is to refuel with lunch at the husband-and-wife owned Solstice Woodfire Café & Bar. Although the café offers a full menu of farm-to-plate fare, the pizza can’t be beat. We order a slice of the Country Girl Cherry and Siragusa Pear—both slivers topped with that famous Hood River fruit. (Hood River Valley is the largest pear-growing area in the U.S.). 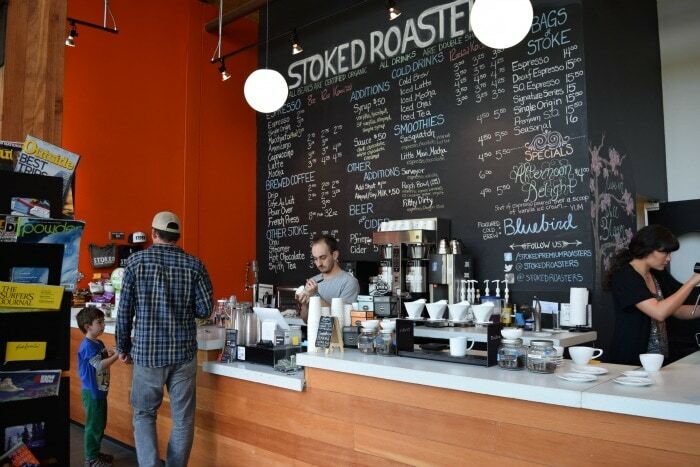 Post-pizza, we swing by the nearby Stoked Roasters and Coffeehouse for an espresso. The coffee shop, owned by local Jax Mariash Koudele (an avid adventure racer) has a sleek white décor and is brimming with sun-kissed athletic types—decked out head to toe in what spans from hard-core cycling gear to serious water wear. We sip espresso from our window-front perch while watching Frisbee-catching dogs and picnic goers at the waterfront park. Next, we drive a few miles east to the teeny town of Mosier. In addition to adventure sports and bountiful orchards, the Columbia River Gorge area is also known as a “world of wine within 40 miles.” With vastly differing microclimates, winemakers in the area grow varietals from albarino to zinfandel. Since we are fans of rose, we head to Analemma, where husband-and-wife Kris Fade and Steven Thompson produce a delicate rose of pinot noir with grapes grown in the Columbia River Gorge AVA. The couple founded the winery in 2010, after winemaking stints in Walla Walla and New Zealand. An opportunity to farm Atavus Vineyard, one of the oldest vineyards in the Pacific Northwest, brought them back to the area. In addition to pinot noir, they produce an aromatic gewürztraminer made with old vines dating back to 1965 and a lively blanc de noir sparkling wine. Both Kris and Steven are in the winery that day, and happy to share their story, talk about wine and even dish on their favorite local places to cycle in the summer and ski through winter. They point us to our next destination, Rack & Cloth, a nano-cidery and café run by Kristina Nance and Silas Beakley. The cottage-style eatery located in the center of Mosier evolved from what began as a CSA and farmstead cidery, into a farm-to-table restaurant. The couple tends to their nearby Pomona’s Branch Farm, growing asparagus, peaches, apricots, apples, vegetables and flowers. The café menu changes daily, reflecting the current harvest from their organic farm and gardens. While dining on the Rack & Cloth patio (the Columbia River rippling in the distance) it’s easy to dream of a small-town life in Mosier. Luckily, we still have the night ahead. We ramble along pastoral roads that sweep past windswept Ponderosa pines and leafy apple orchards en route to our last stop for the day, Three Sleeps Vineyard B&B. The golden-hued Tuscan-style villa rises from a hillside, surrounded by vineyards that provide the estate fruit for Dominio IV Wines. The vista is postcard perfect: simple, elegant, unembellished. Owners Liz and Glenn Bartholomew greet us at the front door with a glass of pinot and guide us to our room for the night. We immediately settle into the chairs on our private terrace overlooking the estate vineyard and poetically named Paradise Ridge. Then I realize it’s time to check off the second whim from my list. Item no. 2: star gaze and slumber surrounded by grape vines. As Cassiopeia twinkles into view, I’m reminded, when it comes to those “things I’ve always wanted to do” lists, there is no time like the present.